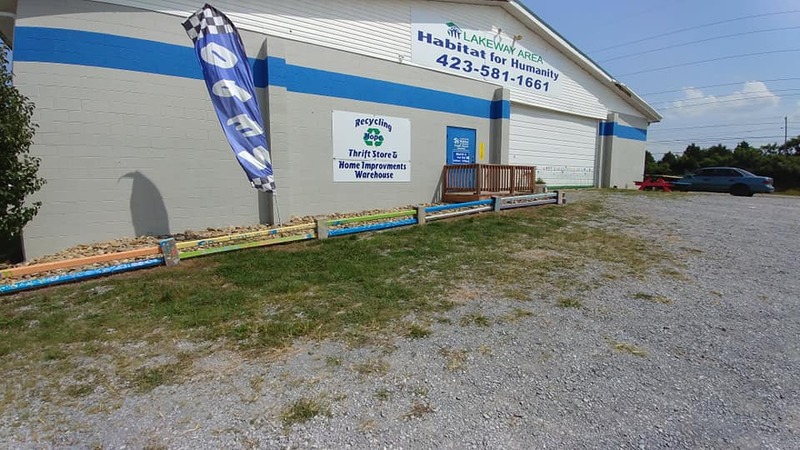 The Recycling Hope Thrift Store began in 2012 as a quarterly, and then monthly, sale in what was then donated space in our current location @ 1080 Alpha Valley Home Rd Morristown, TN. 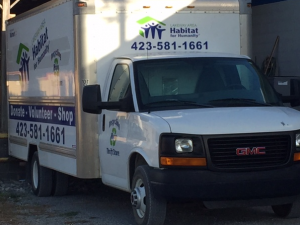 Now, Lakeway Area Habitat for Humanity owns the location and our thriving store is open weekly Tuesday through Friday 9-5pm and the 1st and 3rd Saturdays 9-3pm. What we do is simple. We sell new and gently used donated items to the public at a fraction of retail prices. This allows us to offer low cost goods to our community and to keep perfectly useable items from ending up in our landfills: all while raising money to build and repair homes right here in our area. Recycling Hope Thrift Store is Lakeway Area Habitat for Humanity’s largest fundraising venture. We accept donations from the public, from other organizations, and from local, or national, businesses. You can never tell what will come through our doors. We have seen everything from autographed, framed photos of sports celebrities, brand new marble counters, to cases of Mason Jars. 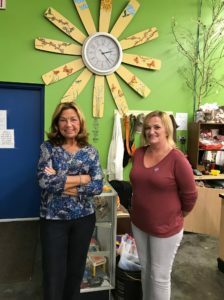 We carry, and accept donations of, furniture, appliances, building and home improvement materials, clothing, home décor, and much, much more. It is always an adventure to shop with us, as well as a blessing to someone in need in our community. 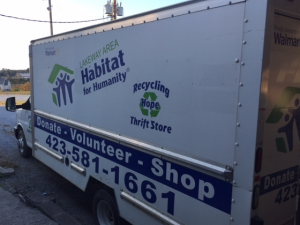 The Recycling Hope Thrift Store’s mission is exactly that of our governing organization: Lakeway Area Habitat for Humanity. We build strength, stability, and self-reliance through shelter. Seeking to put God’s Love into action, Habitat for Humanity brings people together to build homes, communities, and hope. We believe that no one lives in dignity until we all live in dignity and therefore envision a world in which everyone has a decent place to live. Items we will pick up: Bedroom and Living Room Furniture, Large Household Appliances, Countertops and Vanities, Desks, Large tables, Dressers, Bookcases. Items we can accept: Reusable items, such as gently used clothing, furniture, housewares, household appliances, books, CD’s and DVDs, and kids toys. Building materials, wood, plywood, sinks, bathroom vanities, kitchen countertops, and cabinets etc. Items we do not accept: Broken items, severely damaged furniture, tube TV’s, unusable or unrepairable appliances.